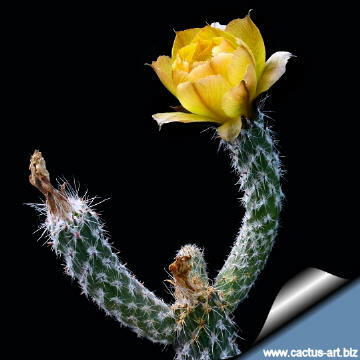 Description : It is a geophyte cactus, with strong underground tap-roots and deciduous branches. Stem: The thin cylindrical segment usually arises basally from the root-stock (or rarely joined). Stems are green to brown, 3-10 cm long and 0,5-1 cm in diameter. 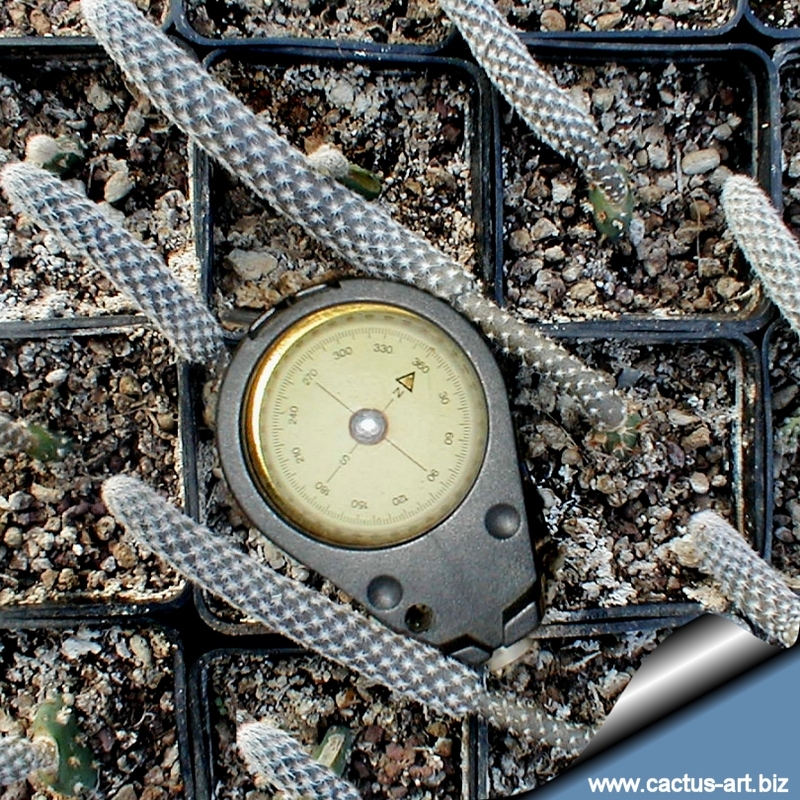 Root: Strong, napiform, cream-coloured, up to 15 (or more) cm long. Areoles: Very woolly, without (or with very few) glochids. 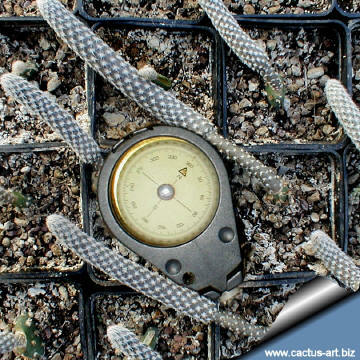 Radial spines: 10-20: very small, glassy, placed almost horizontally against the stem's surface, up to2 mm long. 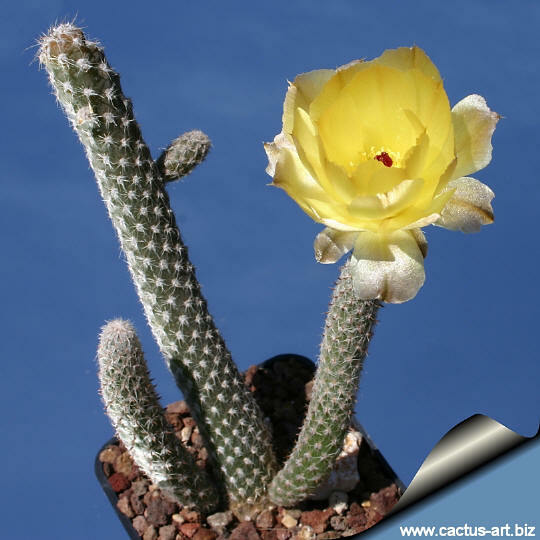 Flowers: Diurnal, rotate, yellow to dirty-yellow, up to 3 cm in diameter, growing apically at the tip of new stems without a clear floral tube distinguishable. Fruit: Dry and larger than the stem itself, dehiscing transversally in the upper part, opening up like a cap and setting the seed free. Seed: Typical of the genus, winged, with a strongly flattened aril; uneven on its periphery. In the wild during severe droughts, the aerial green shoots die back to the underground rootstock. Once rains return, the rootstock produces new green shoots that grow upward until they reach the soil surface. 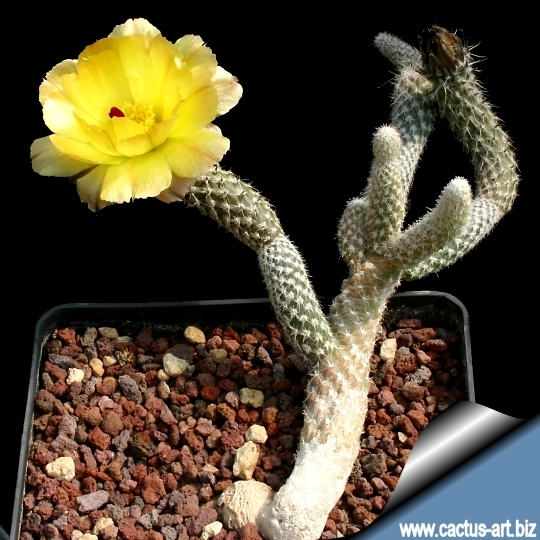 Similarly in cultivation - when top growth is pruned, the plants produce new green stems bearing terminal flowers that open in the late spring or early summer. In any case old Pterocactus branches easily detach spontaneously at the smallest collision. They are nearly deciduous!!! Sometimes a very fragile corky necrotic brown zone forms at the branches' base, helping the shoots to break up at the point of union of root and shoot systems. 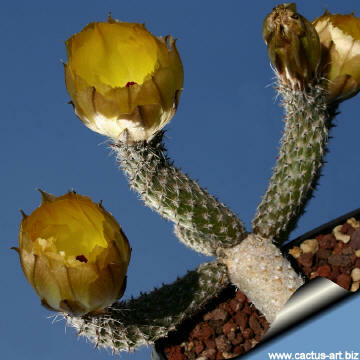 This helps the plant to naturally produce new floriferous stems. The flowers forms apically at the tip of stems. Cultivation: Pterocacti are easy to grow, provided they are kept cold, but dry during autumn and winter. It is essential to give full sun; otherwise they will become atypical. If grown in full sun, the new growth will bloom profusely in spring and summer. Most of the slender stems become detached during winter, but some advise (to help plant) pruning all the top growth in autumn, in order to encourage it to produce stems with terminal flowers in the spring. 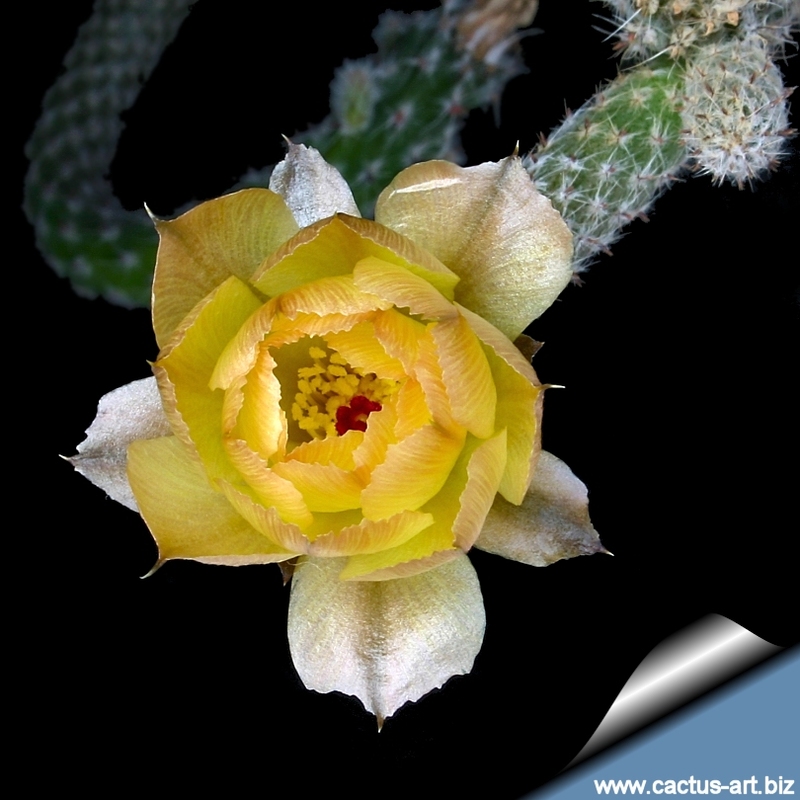 The compass cactus. When we grafted Pterocactus megliolii on Opuntia compressa we noticed - with our great disappointment - that the branches were not erect but they inexorably tilted to a side. The strangest thing was that all the branches were folded up in the same direction: west!!! Ecology: these plants have a peculiar reproductive mechanism: they have the ability to lose their sprouts in autumn and winter. 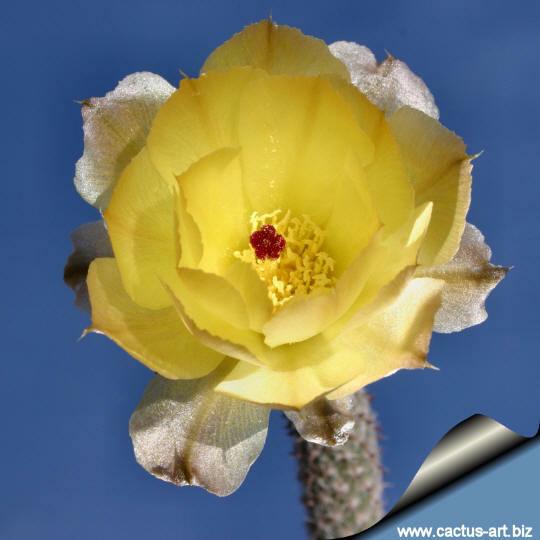 These are then spread by strong winds and volatile sands, and can give origin to a new plant in the next vegetative season. 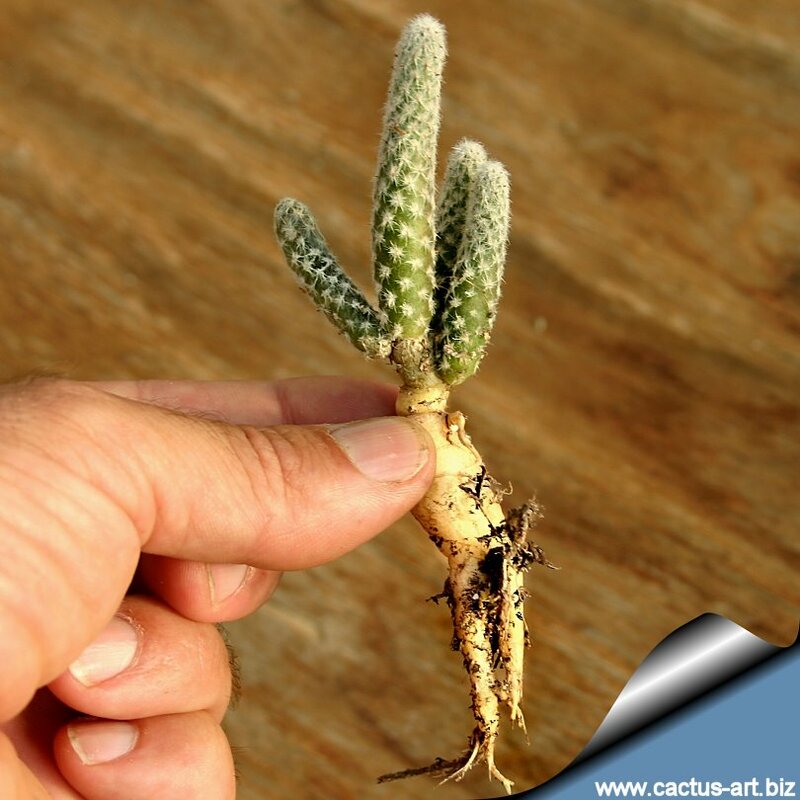 The Pterocactus tuberose roots will grow new floriferous stems again. 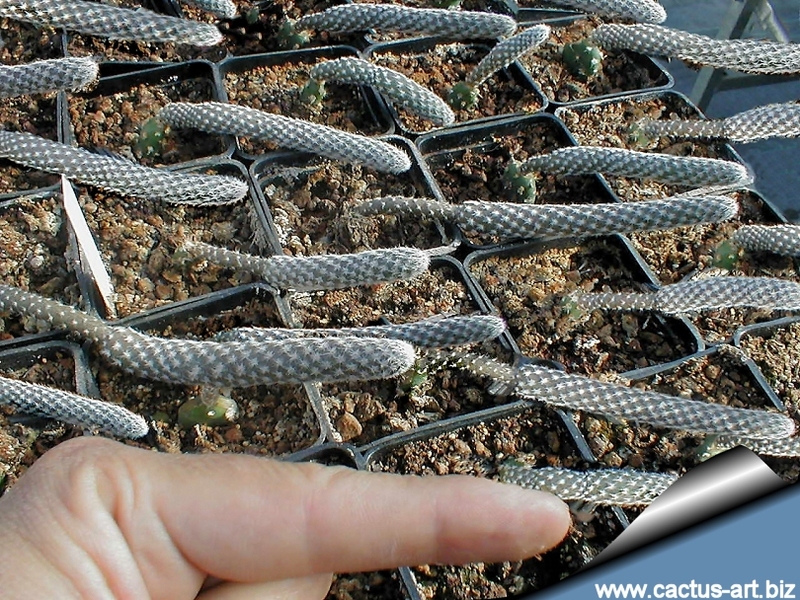 Pterocactus is a rare tuberose cactus that grows with almost the entire plant underground. Stigma is dark red and makes a nice contrast with the yellow flowers.